When you’re a little kid, you don’t always get to pick your childhood heroes. Sometimes, they’re picked out for you. Marvel can thank me for the FREE advertisement I’m providing for Captain America: The First Avenger (in theaters everywhere TODAY! 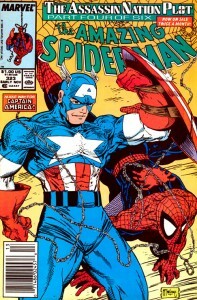 ), but never one to avoid a bandwagon, I thought today was as good a day as any to talk about Captain America. When I was really young, I’d say that Spider-Man and Cap were #1A and #1B in terms of my favorite superheroes. 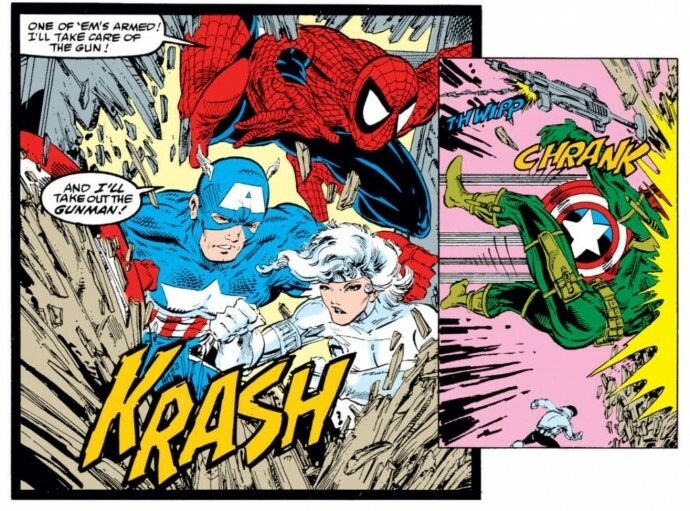 Who knows, if I was never picked-on and bullied as I got older, I may not have gravitated so strongly to Spider-Man and instead you might be reading a blog called “Crazy for Cap” or something of that nature. When I think about Captain America these days, I come back to ASM #323. Cap has been on other ASM covers in the past, but this issue may be my favorite, and in its own way, it also represents the prism through which I currently view Cap and Spidey. 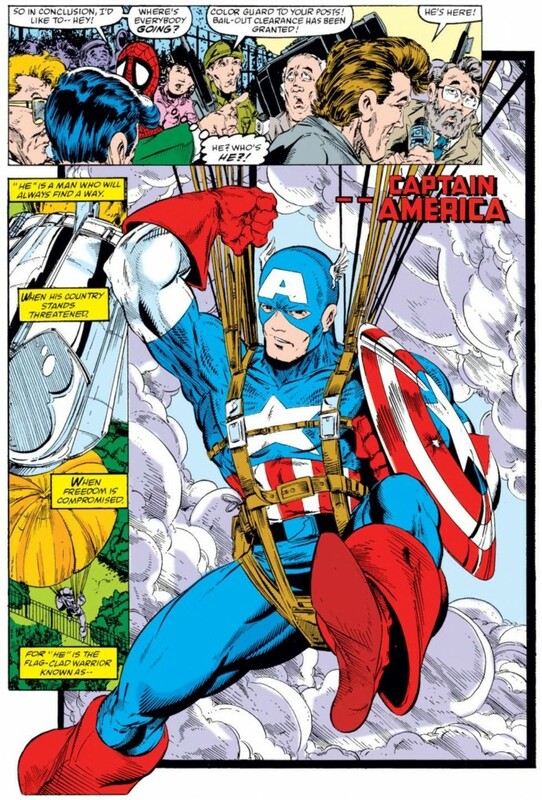 Here, as part of the David Michelinie-Todd McFarlane, six-part arc “The Assassin Nation’s Plot,” Captain America is brought into an international incident involving the assassination of the Prime Minister of a country known as Symkara. 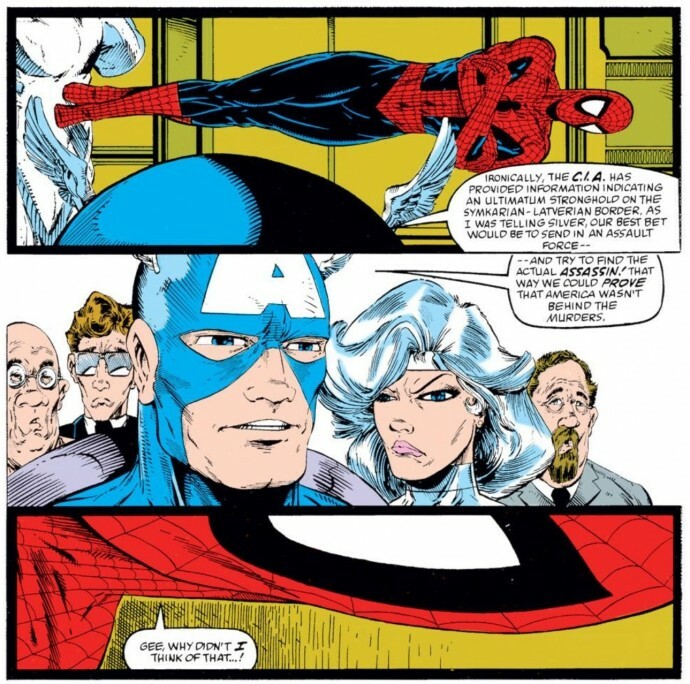 Despite Spidey originally being pegged as one of the Silver Sable’s mercenaries for the assignment, Cap and his red, white and blue edge him out as the go-to guy. McFarlane’s art captures Cap looking strong and proud, but almost a bit oblivious to Spider-Man behind him. Considering this is an Amazing Spider-Man comic book, the illustration gives off the impression that he’s co-opting the cover. 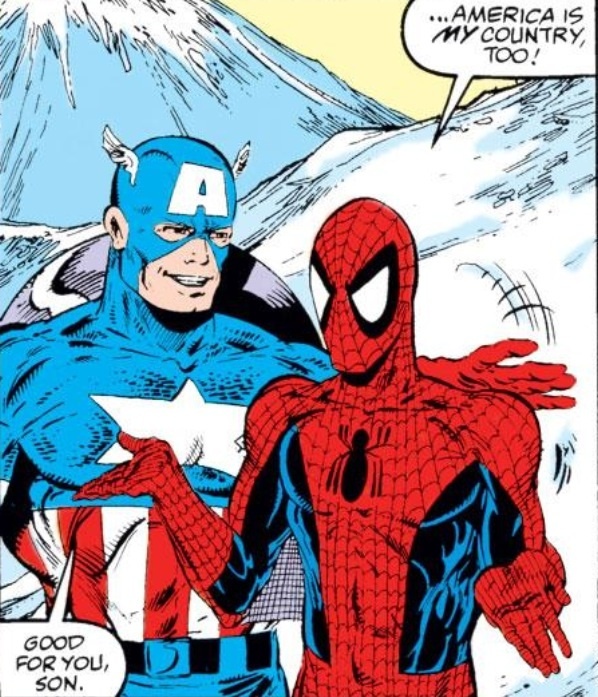 Even with my love for Captain America, as a Spider-Man fan first, I kind of want to see him slip under Cap’s left arm and shield and burst out in front. But that doesn’t happen from a storyline standpoint until the last issue, where Spider-Man ultimately succeeds in foiling the Red Skull’s plot to frame the United States for the assassination. So, in isolation, ASM #323 is just another case where the superhero adults are unwittingly shoving the superhero youngsters to the back. When I was around 5 or 6, my father brought home a series of VHS cassettes that he had picked up at the now long-closed Woolworth’s. Each video spotlighted a different hero or villain and contained a few episodes from the old 1960s cartoons. I owned a Fantastic Four, a Spider-Man and a Captain America video. You’d think, considering where I am today, I would remember watching the Spider-Man tape ad nausea, but instead it was Captain America. In fact, just recently I was singing the old theme song in front of my wife – “when Captain America throws his mighty shield” – and in addition to sounding like a crazy person, I was amazed that from all my years of watching those old cartoons, that was my biggest takeaway. The Captain America theme song. Everything else seems to be a hodgepodge of childhood memories, and more recent memories from youtube clips and various pop culture references. But I can tell you, in no uncertain terms, I remember that Captain America theme because I must have watched that video 900 times. Something like that doesn’t stick in your brain so clearly unless there’s been a lot of repetition. When I started buying comic books at the local newsstand, my first few issues were of Amazing Spider-Man. But I also remember a period around 1989-1990 where I was buying exclusively Captain America comics. Why the change of direction? Looking back at this period now, it all makes sense. Back when I was making my earliest purchases, I was usually at the corner store with my older brother. And as I mentioned in a previous post, one of the main reasons I first picked out an issue of ASM was because he picked out the same one. Jump forward a few years, and after attending church with my father on Saturday nights, he would take me across the street to the same corner store and hand me a dollar to buy a comic book. And whenever I was with him, I went with Captain America. It’s not that I didn’t like Captain America. 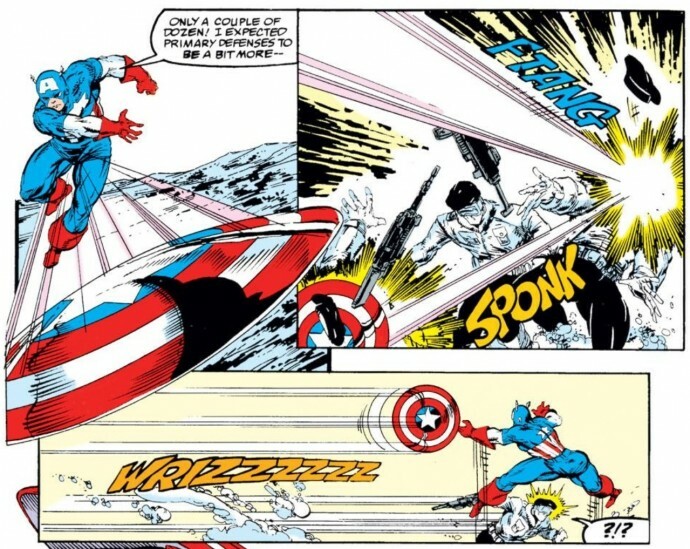 The boomerang style shield is a pretty awesome weapon, but the concept of a super patriotic hero who becomes super-strong due to a government experiment is not something that resonates with me now as an adult. Not that I don’t love my country (God Bless America, USA USA USA!!! ), but I would probably be appalled if I learned that the U.S. Military was involved in some kind of super soldier program. Without getting into an actual political debate here, I’ve always leaned much more left-of-center than the old-school ideals Captain America seems to embody. And considering my father is definitely more right-of-center, we’ve had some heated arguments over the years discussing the merits of “Captain America” versus “Spider-Man” (insert any political hot-topic in place of those quotations). But still, my father is my father, and just like I was trying to impress my brother years before with my purchases of ASM, I think I started picking up all of those Captain America issues because I remember my father bringing home those videos for me – and I’m taking a wild guess that the reason why the Captain America cartoon theme still sticks with me so vividly is because my father was likely the one who plugged that VHS into the VCR. My father’s opinion was important to me, and if he was at peace with me watching or reading Captain America cartoons and comics, I was going to keep on doing it until I gained the courage to one day do what’s best for me. In terms of comics, that was Amazing Spider-Man and Spidey alone. I’m sure if I talked to my dad about this today (he doesn’t use a computer so he will never read this), he would tell me I was out of mind – that my early fascination with Captain America had nothing to do with some kind of unconscious tug-of-war between father and son over the old guard hero and the newer, younger Spider-Man. But I can’t help but look at the cover of ASM 323 and think about these things – about how impressionable a young kid can be, and about what a contrary pain in the neck we become once we’ve learned how to adequately think for ourselves. And how in this exact moment in time, Captain America is front and center and leading the way. But eventually, the superhero falling behind will push his way through, where he will remain for generations to come. Hi, just found this blog today, I’ve been scrolling through the last couple weeks of posts, good stuff! I collected ASM for about 15 years. I had a few random issues I picked up in the 1970s, but I didn’t start making an effort to collect until #204 and continued until the ‘Clone Saga’. I went back and bought back a bunch of back issues. I had every issue from 136 to 404. Not bad, but nothing like your ASM collection. I feel like Captain America’s political leanings tend to depend on who’s writing him at any given moment. He’s always patriotic, but his concepts of American ideals can shift… His rejection of the Superhuman Registration Act in Civil War seemed pretty left-wing to me. Nifty blog, by the way. I discovered it a few weeks ago and have been following it regularly. Steve Rogers is an almost Bernie Sanders old lefty. He’s for the little guy and wants EVERYONE to have a crack at the American Dream – the opposite of a neocon. Steve Rogers believes we’re only as strong as the weakest among us. I’m also a left-of-center Cap fan who loves his country and honors the service of relatives who fought in wars, both recent and long ago. Besides all the (mostly Gruenwald-era) back issues of the title, I’ve got 9 ‘Captain America’ reprint tpbs on my shelf. I don’t think Cap should be a liberal or a conservative and I think part of his original strength came from the fact that Simon was a conservative Republican and Kirby was a liberal Democrat.